Quiet-methodical, angry-powerful, or loony-happy? Drummers often seem to fit into one of these three categories. 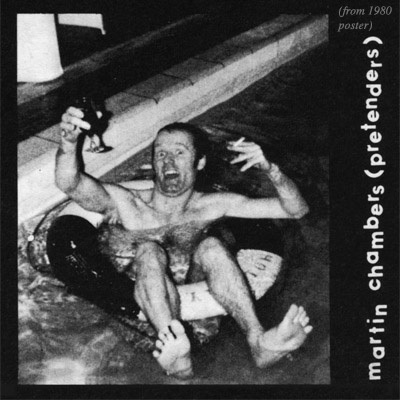 Seems like the photo above makes it pretty clear which one Martin Chambers fits into. Just so we know where we stand, though, here are some examples: Quiet-methodical: Charlie Watts, Sly Dunbar. They get their head down and keep the groove always in the pocket, no flash, but solid as can be. Angry-powerful: John Bonham and Ginger Baker. Scary guys to meet face-to-face (have done) but amazing powerhouses of blockbuster, thunderous beats. And in the loony-happy bunch, along with Martin, the inimitable Keith Moon, (met him too – a lot!) hilarious wrecker of stages (and sadly, of himself in the end) and even, a bit, our lovable moptop Ringo. I’m no bleedin’ journalist, though. I know from being interviewed countless times how often music journalists love to put people, music, things in general into categories so it makes for hard-hitting, easy-to-assimilate copy. Martin and all the above-mentioned drum giants are no categorisable cartoon characters, and I am sure that all of them at times have felt (and played) the multitude of conflicting emotions we all feel. But when back in the mid-70’s I first saw Martin play with a little known band called Cheeks, along with Verden Allen, my keyboard predecessor in Mott the Hoople, I knew that here was one wild man with great technique and loads of humour. His eyes looked ebony black but sparkled with endless fun and energy, and he had one cymbal set so high that he had to stand to hit it, so he was up and down, on and off his drum stool throughout the show. Definitely the centre of attention and the man to watch in this band, even though guitarist James Honeyman-Scott (who went on to form the Pretenders with Martin and play the blindingly brilliant solo in this song) was riffing magnificently on the same small stage. In 78 The Pretenders hit the ground running, and from the first of numerous gigs I saw them play at The Marquee, I knew that here was, not a good band, but a great band. On more than one occasion I hinted strongly that they’d be even greater with a keyboard player. There was one reggae-style number they played which (I thought, and told ’em so) cried out for some thin reedy XTC/E.Costello-style organ. Oh well. They seem to have managed quite well without it/me. Sadly, very sadly, after having scored several hits including their marvellous UK #1 “Brass in Pocket” half of the band – Jimmy and Pete – both lovely chaps and great players – were dead due to drugs. It was now down to Martin and singer Chrissie Hynde to pick up the pieces and soldier on, which they did, magnificently (see wiki for the whole story) . Various members (including Martin as well as Johnny Marr and Andy Rourke of The Smiths) came and went over the ensuing decades, but when the band were inducted by Neil Young into the Rock’n’Roll Hall of Fame in 2005, it was only Chrissie and Martin who stepped up to accept the award. They then played a blinding set kicked off by Martin’s thundering drums, several orders of magnitude more powerful, fun and REAL than many so-so reunions one hears at these events. The band’s website currently shows nothing but Chrissie’s new (and first) solo album. So I can’t say if the band have performed since they were the featured attraction at the Singapore Grand Prix in 2012. But you can be sure that Martin has been busy, as one of the most in-demand session drummers around. Another Pretenders website has a large archive of videos where you can see Martin in action. There’s a bird called the swift – it’s [a] very enjoyable creature. And it can sleep on the wing. Eh, what I’m trying to tell you is, like, the wings, the wings beat at different speeds. And when the wings beat at different speeds they, like, go [in] different directions somehow. It’s got a wingspan of about 7, 8, 12 inches – somewhere near. In the nest they have little funny things which, like, catch onto the backs of them. They got six legs and they look very ugly. They ruin the life of the swift. The swift is capable of flying [at] at least 80 miles an hour. In a dive, it’ll probably get up to 120. Mott the Hoople’s drummer, Dale “Buffin” Griffin had almost single-handedly kept the band’s flag flying devotedly for over three decades since the late 70’s, producing (and writing the sleeve notes for) numerous reissues of the band’s albums as well as collections of rare demos and live tracks, many on the Angel Air label. Therefore it was poignant, to put it mildly, that when the band finally got together for their 40th anniversary concerts in London in 2009, Dale was unable to play more than the encores, having been diagnosed with Alzheimer’s Disease. The obvious, and only choice for a substitute drummer was Martin – born in the same town as Mott’s founder, and good friend of the band since before they began. 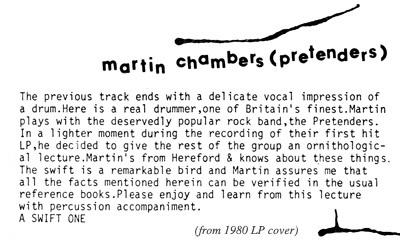 Of course, friendship was not the only reason – Martin also happens to be absolutely on a par with Dale talentwise (for me Dale is THE best drummer I’ve ever played with, bar none), and doubtless he knows most of the Mott material as well as he knows a drumstick blister on his palm. It was one of the most moving sights I’ve ever seen on a rock stage, Martin encouraging Dale to play his best at those encores (which he did), keeping his eyes pinned on his fellow drummer as the two bashed out stomping rhythms together – Dale actually remembering some cues and fills better than Martin. Amazingly, during those 5 nights at Hammersmith, Dale was on occasion not able to recognise me and his other old bandmates and friends offstage – but when Dale was onstage he was ON! Such is the power of music. And such is the power of Martin’s passion for music and for his friends and for just sheer energy and fun and The Beat. Long, long may he keep on bashing! As Miniatures I and II are wonderful, the blog is indispensable. Thanks for enlightening…! Fantastic, reading about the Mott the Hoople concert brought back memories of watching Martin take care of Buffin at the reunion concert. I had a tear in my eye at Hammersmith and did again reliving the memory. Martin is a great drummer in his own right. He has proved himself as an amazing person. Thank you. Incidentally my son is named Dale. We were able to see the Mott the Hoople reunion in Newcastle together last year. It was an amazingly emotional evening. When he told me “the sound hit him in the chest” it reminded me of how I felt back in 1973.